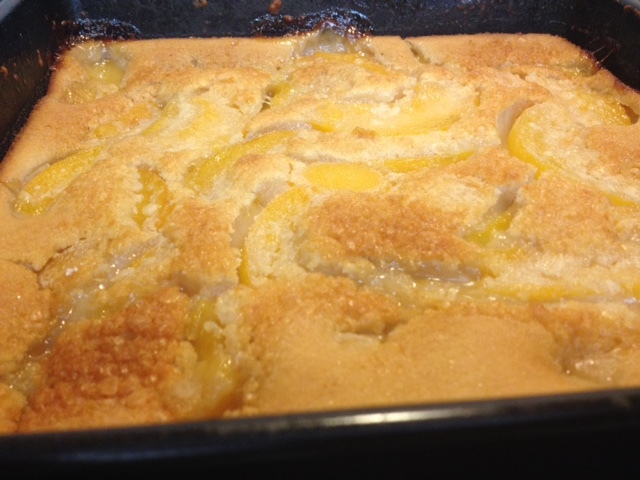 This peach cobbler recipe is a family favorite. Mainly, because of the great taste, but also for the simple fact that peaches are readily available in the great state of Georgia. My mother showed me how to cook this dessert when I was about 10 years old. This worked out great for me, because I was able to get in the kitchen whenever I wanted to bake this dessert. Unlike most pie dessert recipes which can be difficult to bake, this cobbler dessert is easy to create. If you don't already know so cooks consider cobblers to be the easiest dessert of all to bake, even easier than a cake. All you have to do is follow these easy and very simple baking instructions to have a delicious dessert on your table in a little over an hour. Treat yourself today by trying this delicious dessert recipe. Preheat oven to 350 degrees Fahrenheit. While you're preheating your oven, go ahead and melt 3 tablespoons of butter into a baking pan. Combine flour and sugar into a mixing bowl and stir briefly. Next add whole milk and vanilla extract, then mix thoroughly. By now your oven should be preheated and your butter melted. After the butter has melted, pour your mixture to the baking pan. Next evenly distribute your sliced peaches over the mixture. Do not stir. Bake at 350 degrees, in the center of your oven for 1 hour until peach cobbler is golden brown. This recipe will feed 4 to 5 people. This is one of my favorite desserts and something I prepare often for my family and friends. If you have not already tried making this yourself, you are missing out on preparing a dessert that is simple to bake but taste so great. Want more great dessert recipes like this Soul Food Cobbler?